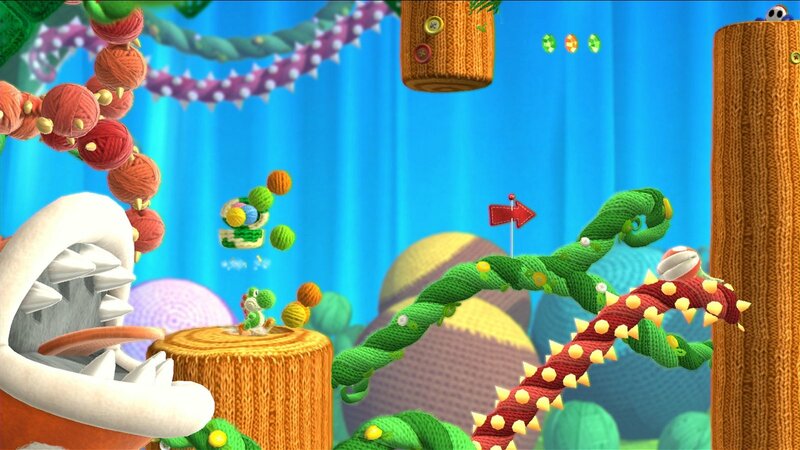 Yoshis are cuter than ever in Yoshi’s Woolly World. The story is that of rescue. 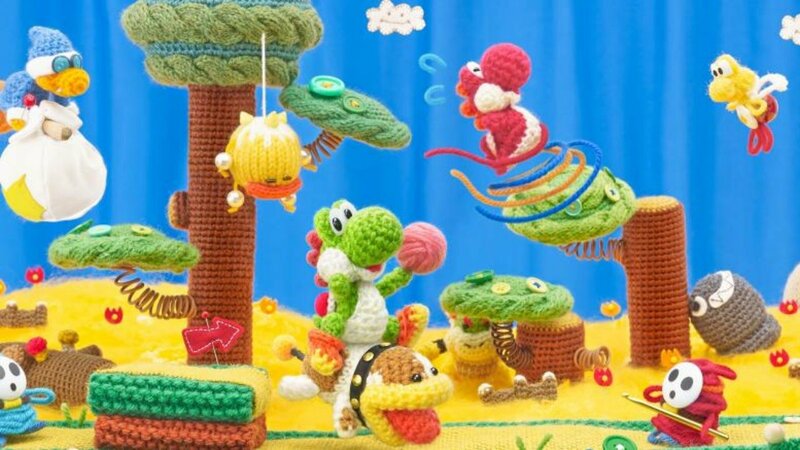 Kamek has come to disturb the balance in the knitted world of Yoshis by turning all but two Yoshis into bundles of yarn. The two surviving Yoshis set off on an adventure to rescue their friends and re-knit them back to life. Good-Feel nailed the yarn texture; the whole world is a clever use of yarn and other crafting materials. Shy Guys carry crotchet needles, Yoshis can pull strings to unravel hidden items, shoot yarn at enemies to entangle them in the string, or even eat enemies to poop them into yarn balls. The music is very reminiscent of early Mario games, bringing a feel of nostalgia to the game while still being fresh and modern, while the controls are simple and familiar. Have a friend? Yoshi’s Woolly World is a fantastic multiplayer experience, although there is bound to be some rage involved. Yoshi’s multiplayer is similar to New Super Mario Bros Wii. Characters are solid, not allowing players to past through each other, causing frustration when you accidentally push each other off the edge; however, this also helps to add a layer of problem solving and difficulty. Veteran players will appreciate the added difficulty of a second Yoshi, but if you don’t have a friend but wish to play with another Yoshi, just tap any Yoshi Amiibo to the Wii U pad for a CPU Yoshi to join you in your travels. If extra problem solving is unappetizing, Woolly World offers a Mellow Mode. Mellow Mode will equip Yoshi with wings, allowing him to hover. This actually makes Woolly World an excellent game for younger kids and novices alike. It’s a great introduction to gaming for parents looking to start their children off. It allows them to get a handle for platforming with less chance of death and frustration and is a great stepping stone into the rest of the Mario titles. There are some creative gameplay elements; however, the best ones are underutilized. Being able to jump on bubbles and through clouds is the most enjoyable platforming but doesn’t appear that often. There are also areas where the Yoshis will turn into various vehicles to race against time and collect items. It’s incredibly lively and would have made for a better Bonus Game than the one offered. At the end of each level (aside from boss castles), players are given the opportunity to grab a flower that grants a quick Bonus Game. Bonus Games are comprised of jumping around and collecting fruit as a timer counts down. They’re simple and there is no negative aspect to them whatsoever, which makes me long for the days of the Sonic 3 bonus gumball machine which involved more skill, or even the chance bonus game from Super Mario World that filled the player with tension as they picked the order of the boxes. Come on, 1-UP! There are little to no problems with Yoshi’s Woolly World, but there is also very little that is new and exciting. While it feels right at home in the Mario universe, I feel like I had seen most of it before. Old enemies, old powers, gameplay that anyone who has played any Mario game in the past would be familiar with; it’s enjoyable but stale. The yarn overhaul is not enough to mask that we’ve seen it all before. While the formula is solid, with SO many game titles in the Mario universe, fans will start to get burnt out on this type of gameplay if it is not invigorated with some new blood and experiences. 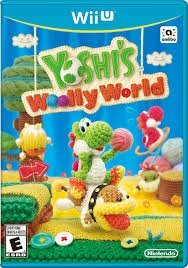 There is nothing wrong with Yoshi’s Woolly World. It’s fun, progresses in difficulty, and has everything one would expect from a Yoshi game, but it feels generic. It demonstrates that Nintendo games have been nerfed since the first days of Mario, and while this does allow for easy hand-holding introductions into the gaming world, older fans will long for more challenge. However, it’s not broken, and Mario/Yoshi fans will welcome this title with open arms with all the nostalgia it brings and will have no issues with it sitting proudly on their game shelf.